Cutting firewood can get old fast, especially if you use your wood stove for a primary heating source throughout the winter. Every little gadget that makes the job easier is to be appreciated, and something simple (and inexpensive), such as this "Wood Blaster" Log Splitter Wedge is worth looking into. The simple steel wedge makes splitting logs easier, and according to the reviews at Amazon, it holds up pretty well over time. It's under $15, so should pay for itself pretty quickly in the time it saves you. The snazzy red paint is a nice touch too, just in case you (or beloved children) tend to toss the wedge on the log pile when you're done with it. The red should stand out and be easy to find. Traditional energy costs are rising but firewood isn't as cheap as it once was either. 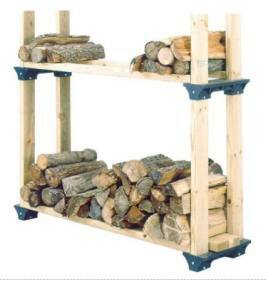 To get the most warmth for your money, you may want to buy the best firewood in terms of output. When looking at the energy content per air-dried full cord of wood in thousands of BTUs, the hardest species top the list, according to a chart at woodheat.org. The best firewood is Rock Elm at 32,000 BTUs per cord. The list goes on, but if you just remember to choose hardwoods, you should be okay. After all, you may not be able to find cords of "rock elm" for sale on Craigslist! In the end, the best firewood is what's readily available in your area at a good price. To save money, try to shop for firewood in the spring, after the cold season has ended, and buy enough for the next year. Now that the weather is cooling off, you're probably not excited at tramping through snow and rain to get to an outdoor wood pile. Understandably, you'd probably prefer to keep some wood indoors, especially if you rely on a wood stove to heat your home in the winter. That's fine, but you want to be cautious about bringing more than wood inside. Field mice, snakes, and insects like to make their homes in stacks of cordwood. And they love it when their wood pile is suddenly transported to a warmer more comfortable environment. So, be careful when storing wood indoors not to bring in insects and other wildlife along with your logs. Sitting next to a crackling fire on a cool evening can be an enjoyable experience, but that's only after the hard work is done: toting in the firewood. If you're using your fireplace or wood stove often (especially if it's your main source of heating) that chore can get old very quickly. To make things easier, you might get yourself a little cart, something with wheels perhaps? 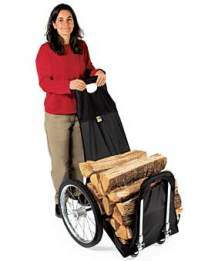 This folding firewood cart is from the Gardeners' Supply store and is available for $30. The 27" wide cart is big enough to handle large logs while still fitting through your standard 32" doorway. All in all, it should make things easier than dragging in the wood in your arms or a hand-held carrier. If you need a rack to house your firewood, but you don't want to spend a lot of money on something fancy, this simple kit might be the answer. The Finley Firewood Rack kit costs $15, and then you supply your own lumber (only straight cuts are required, so you don't have to be a real handyman--or woman--to put this together). It's inexpensive but it'll do the job. Tired of starting fires with newspaper? Tired of having it take a long time to get started no matter what you use? Well, you can get specially designed fire starters that make the whole process of building a fire much quicker. One example is this bundle of "fatwood" available from Brookstone. "Taken from southern pitch pine stumps, fatwood contains a highly flammable natural resin. 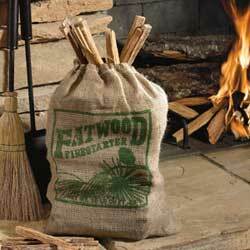 You need to use only a couple of sticks to start fires in your fireplace, wood stove, or campfire. " Brookstone sells 10-pound and 25-pound bags, priced at $14.95 and $34.95 respectively. A 10-pound bag contains approximately 200 pieces of fatwood (it's only supposed to take a couple of sticks to start a fire). Allow air circulation by leaving the sides of the woodpile uncovered. Also, don't stack your wood tightly; go ahead and leave air between logs. Cover the top of your pile to protect the wood from rain and snow. Either a woodshed roof or tarp works, but try not to have a tarp resting directly on the pile (this impedes air circulation). Instead, leave a few inches of air. Raise your wood pile off the ground to keep the bottom layer from soaking up dampness. Wood pallets or scrap lumber work for making a platform. Safety first: wear eye protection at the least. Steel-toed boots and shin guards can further save you from being hurt. If possible, split wood when it's freshly cut (except beech). Strike the most recently cut end. If the wood has branch stubs, split the end pointing in the opposite direction from the branches. If you can't split the wood when it's fresh, wait until it's cold out; wood splits best when it's frozen. To save your maul, use a chopping block. Also it a chopping block doesn't give or diffuse the blow's force like ground does. If possible, avoid splitting directly through knots. If your wood always tips over when you to try split it, get an old tire (smaller ones are better) and stand the wood in it. If the wood just isn't splitting, try the other end before hauling out the wedges for rip cuts. 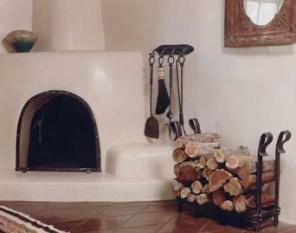 Which Wood Keeps You Warmest? Weight -- Seasoned wood is noticably lighter than green wood of the same species. Loose Bark -- When wood dries, the bark tends to fall off more easily. This doesn't mean any wood that still has bark firmly in place is necessarily green, but in a cord of seasoned wood, you can find quite a few pieces of wood where the bark has sloughed off. Smell -- Fresh, green wood smells pleasant with a sap-tinted aroma. Seasoned wood still smells like wood, but the scent won't be nearly as strong. Color -- As wood seasons, the color of the sapwood on the ends and split sides fades; a cord of seasoned firewood should look dull and subdued rather than bright. Cambium -- The cambium is the very thin layer between the bark and the sapwood. If you suspect some wood of being green, peel back a section of bark and check for greenness in this layer. If it's green, so is the wood.